When we reported that Sellaband folded in late February, it looked as though Public Enemy's hopes of having their 13th studio album funded entirely by fans were pretty much dashed. Initially, Chuck D, Flavor Flav and co. proposed a target of $250,000 U.S. to release the album. But after a promising start, investment soon stalled, and when Sellaband collapsed, it looked like the album wasn't to be. Well, the band are now back on the revamped Sellaband, and they've switched their goal to just $75,000. In a statement, the band said, "As a result of our Sellaband experience and all that we have learned, we now believe that a $75,000 fund raising target will fulfill the needs for a new recording project and is much more appropriate for the strength of the existing Sellaband model and the current economic climate. We also have reached the conclusion that we will no longer include expenses for sales and marketing in our fund-raising budget and goals." 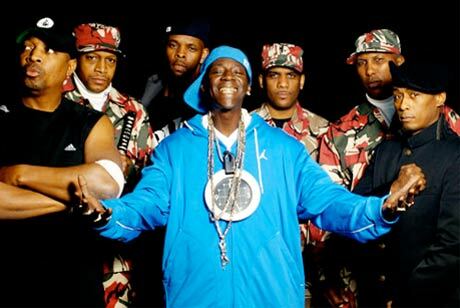 As of press time, Public Enemy have raised $56,325 and have reached 75% of their goal. If they succeed in releasing the new album, it would mark their first since 2007's How You Sell Soul to a Soulless People Who Sold Their Soul?? ?